KINGSPORT, Tenn.- The Kingsport Mets released their 2018 coaching staff Friday and will feature a few new faces this season and a familiar one as the new manager of the Kingsport Mets. Sean Ratliff, who served as the Kingsport Mets hitting coach in 2015, will take over as Manager of the Kingsport Mets, the Appalachian League advanced-rookie affiliate of the New York Mets. He replaces Luis Rivera who was promoted to bench coach for the Double A, Binghamton Rumble Ponies this season. Ratliff begins his fourth season coaching in the Mets organization and his first year as a Manger. Ratliff spent the last two years as hitting coach for the short-season, Brooklyn Cyclones. He was the Mets' fourth-round draft pick in 2008 out of Stanford University. Ratliff reached as high as Binghamton (AA) of the Eastern League before an injury forced his retirement in 2012. Josue Matos returns for this second season as pitching coach for the Kingsport Mets. He enters his third season as part of the Mets organization. He spent the 2016 campaign with the GCL Mets. Matos served as the assistant pitching coach for Mayaguez in the Puerto Rico Winter League in 2015 and 2016. He played in the minor leagues for the Seattle Mariners, Toronto Blue Jays and Philadelphia Phillies organizations from 1997-2005, making it as high as Triple-A. Matos pitched for Puerto Rico in the 2006 and 2009 World Baseball Classic. Delwyn Young begins his first season as hitting coach for the Kingsport Mets and his first season as a coach in professional baseball. Young, an infielder, played in the Major Leagues for five seasons from 2006-2010 for the Los Angeles Dodgers and Pittsburgh Pirates. He has a .244 career batting average. Young was selected in the fourth round of the 2002 First-Year Player Draft by the Los Angeles Dodgers. Vanessa Weisbach begins her first season as Athletic Trainer with the Kingsport Mets. She has worked the previous two seasons as an Athletic Trainer in the Mets organizations in Port St. Lucie, FL. Weisbach graduated from East Stroudsburg University of Pennsylvania with a B.S. in Athletic Training and a master's degree in Athletic Training. John Perry begins his first season as Strength and Conditioning Coach in the Mets organization. Perry was a Strength and Conditioning Coach at Georgia Tech in 2017, working with the baseball and football teams. He graduated from Kennesaw State University with a B.S. in Health and Physical Education and earned his master's degree in Sports Management from Arkansas-Little Rock. 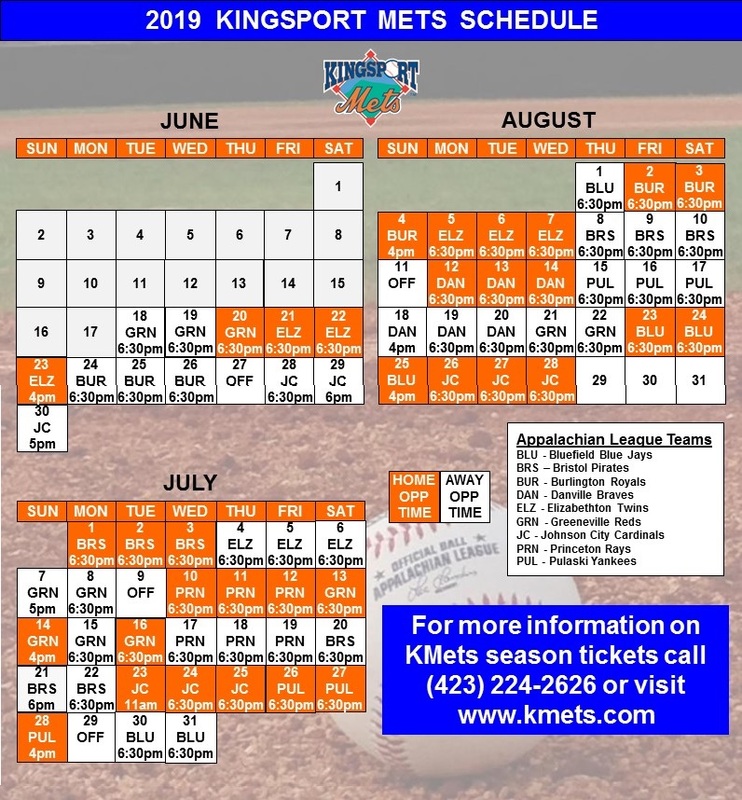 For more information on the 2018 Kingsport Mets season, season tickets and sponsorship opportunities please contact the Kingsport Mets office at (423) 224-2626, email at info@kmets.com or log on to www.kmets.com. Check us out on Facebook and follow us on Twitter.